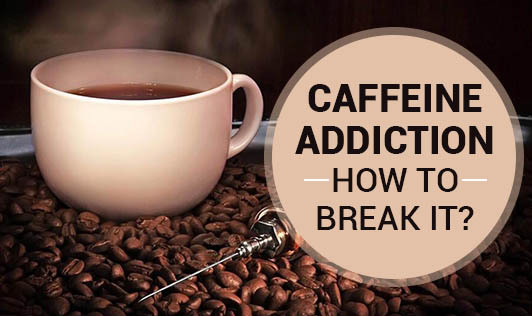 Caffeine Addiction--How to break it? Coffee, tea, chocolates, colas...Awe! Who likes to stay away from all these? 1. Get more sleep, rest, and relaxation. Make time to fulfill emotional, physical and mental needs. 2. Introduce green tea or herbal teas into your routine. They are good anti oxidant source. 3. Reduce the intake gradually- Start replacing your caffeinated beverages with the decaffeinated versions. Consider switching slowly to water, fresh juices, herbal drinks as substitutes. 4. Balanced Diet - A healthy diet involving sufficient quantities of fruits and vegetable is extremely vital to cut back on caffeine. Consumption of complex carbohydrates, Vitamin C and Vitamin B Complex will support your adrenal system and will, in turn reduce your caffeine cravings. 5. Adopt a healthy lifestyle. This involves a balanced combination of exercise, sleep and proper hydration. 6. If you are finding it extremely difficult to quit caffeine products on your own, you can seek help of rehabilitation centers. Also find someone to quit with you. Make promises to the ones you love, which can be rewarding and help you quit at ease. 7. Sit down and calculate how much time and money you actually spend on caffeine. Think of other things you could do with that time and money. 8. Make time to relax and enjoy simple natural highs. Get comfortable with feeling good and stress free.